William Welsh shares with us the highlights of visiting Manassas Battlefield Park, and why it's become an essential site to visit for any Civil War or American history enthusiast. The first thing that strikes a visitor to Henry Hill at Manassas National Battlefield Park is the spectacular view. On a clear day, the Blue Ridge Mountains are visible nearly 40 miles away. The second thing that strikes the visitor is the large number of cannon. Black-barreled rifled artillery of the Union batteries dot the western side of Henry Hill, and bluish-green Confederate bronze smoothbores line its eastern crest. While the two aspects are obvious, another is more subtle: whichever side controlled the hill would surely win the First Battle of Manassas. That, as we now know, was the Confederacy. The sprawling 500-acre battlefield is located on the southern periphery of the Washington, D.C., metropolitan area and is easily reached from Interstate 66. It’s a lot like a grocery store “buy one, get one free” deal in that the visitor can tour two battlefields in one park. Manassas battlefield encompasses the ground over which green armies clashed at First Manassas on July 21, 1862, and also ground where veteran armies met again at the Second Battle of Manassas on August 28-30, 1862. Many of the greatest vignettes of the American Civil War are tied to Manassas National Battlefield Park. It’s where former Virginia Military Institute professor Thomas J. Jackson, a brigadier general at First Manassas, received his legendary nickname “Stonewall” Jackson. It’s where the legendary Union “Black Hat” Brigade went toe-to-toe against the Stonewall Brigade at Second Manassas, showing that Yankee soldiers were just as tenacious as their Rebel counterparts. It’s where the Louisiana “Tigers” hurled rocks at the Yankees along the Unfinished Railroad Cut at Second Manassas when the Rebels ran out of rifle ammunition. The visitor center atop Henry Hill serves as the park’s hub, housing park offices, museum exhibits, restrooms, and a large bookstore. It is there that visitors can view an orientation film, pick up maps and trail guides, and have one-on-one discussions with rangers and volunteers who are experts on the two battles. Rangers lead regular tours atop Henry Hill for First Manassas, and also at the west end of the park at Brawner Farm Interpretive Center for Second Manassas. Manassas was the setting for the two battles for different reasons. At First Manassas, Confederate forces used Bull Run as a strong defensive position against an attacking Union force. In the case of Second Manassas, Jackson, by then promoted to major general, had a keen eye for good defensive ground. He dug in behind an unfinished railroad grade after his corps pillaged the Union supply base at Manassas Junction. It was in that position he held off repeated Union attacks until such time as he was joined by General Robert E. Lee and the Confederate I Corps under Maj. Gen. James Longstreet. Once the two corps united, they smashed the Union army of Maj. Gen. John Pope. What are the must-see sites for First Manassas? Besides Henry Hill, it is worth taking the time to visit the Stone Bridge. As for Second Manassas, in addition to Brawner Farm, the Deep Cut, the Stone House, and Chinn Ridge are key sites. 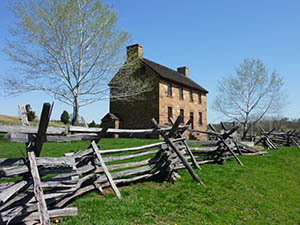 Visitors can take an 18-mile driving tour of Second Manassas that takes in those sites and more. For those planning an extended stay in the area, or for local area residents, there are more than a half dozen hiking trails, many of which are interconnected. Whether by auto tour or on foot, a short visit or a long one, what you find striking about Manassas undoubtedly will be worth sharing with others. Tags Black Hat Brigade, bull run, cannon, Confederacy, Confederate, First Battle of Manassas, First Manassas, general james longstreet, john pope, Manassas, Manassas Battlefield Park, Robert E. Lee, second battle of manassas, Stonewall Jackson, Union Army.